Does this picture look familiar? Does your cat run your household? Don’t worry. You’re not alone. Cats have a way of insinuating themselves into spots where we really don’t want them to be, right? Sometimes, it’s not even their very presence that can pose a problem. It’s the fur they shed that ends up on all the appliances! Most of us would probably just leave them be and let them go and do whatever they want. I mean, how can you possibly resist those cute eyes? Yup. No one wants a cat walking on the kitchen counter. Who knows where those paws have been! So, here are some tips for ending that habit and showing your cat who’s boss. The ASPCA suggests making a kind of precarious (but harmless) trap. Place some cookie sheets slightly over the edge of the counter. The cat will jump up on them, lose balance as the cookie sheets tip, and the clattering noise will scare them off. Cover your countertops with sandpaper, plastic wrap, foil, or any other material that your cat will find unpleasant. At the very least, if it doesn’t deter your cat, your countertops will stay clean. There aren’t too many animals that enjoy the smell of mint. So, mix up some mint extract with water and lightly spray the countertops. Not a fan of mint? Try black pepper, lemon, eucalyptus, cinnamon, or lavender. Do you have this problem? Share your tips! This entry was posted in Cleaning the Kitchen, Cooking, Indoor Air Pollution, Kitchen DIY, Kitchen Safety, Kitchen Tips and tagged cats, clean, countertops, kitchen tips, pets on May 3, 2017 by Mila Hose. With the new year comes all manner of resolutions. Have you made yours yet? One of the most common resolutions that most of us make is to use the coming year to get fit. Sadly, although that’s one of the most common promises we make to ourselves, it’s also one of the first to be broken. It’s not hard to understand why so many of us allow our hopes of getting fit to fall by the wayside. Finding time to head out to the gym in our already packed daily schedules is just too difficult. If you can find the time, sometimes it’s the gym memberships themselves that keep us away. The financial cost can often be prohibitive. Skipping the gym scene for a do-it-yourself approach is a great idea. Heading out for a daily walk alone with your music, or with your favorite person can be a perfect way to stay on track with your goals. But, if you’re anything like me, the novelty soon wears off … especially in the dead of winter or height of summer heat. 10 Squats. Putting something into the oven? Great! Being careful not to open the oven door, place your hands on the handle. Do as many squats as you feel able to do. 10 counter push-ups. Place your hands on the edge of the countertop. Stand about three feet back. Slowly lower yourself toward the counter then back up. 10 tri dips. Stand with your back to the counter. Reach your hands behind you until you can grip the edge of the counter. Stand about three feet away from the counter. Slowly lower yourself backwards toward the counter then back up again. If ten repetitions are too many, don’t worry about it. Reduce the amount to whatever you can handle. Because you’re doing this routine in the kitchen while you’re preparing meals, you won’t give up on it. You can also gradually increase the repetitions month by month as you strengthen your muscles. What were your resolutions for this year? This entry was posted in Cardio, Cooking, Exercise, Kitchen Tips and tagged Exercise, kitchen tips, one minute workout on January 5, 2017 by Mila Hose. This guest post is by Chelsey Wynn, Public Relations and Social Media Specialist, at Wellborn Cabinet, Inc.
Kitchens are often a room that the whole family visits several times throughout the entire day, so it only makes sense that it is a room that needs a little TLC to keep it looking great. Kitchen cabinets store all kinds of items such as cookware, dishes, cleaning supplies, and food, just to name a few. Avoiding everyday messes are nearly impossible, especially with small children. Below are some Dos and Don’ts when it comes to keeping your cabinetry looking beautiful on the outside! Clean spills and standing water immediately to keep from damaging the cabinetry. Pay special attention to areas around your sink, range, dishwasher, toe spaces, and baseboards. Use a blotting action rather than a wiping action. Avoid extreme changes in room temperature. Avoid extremes in room humidity. Too high or too low can cause the wood to warp or the glue used in applying veneers to loosen. When cleaning your cabinets, never spray cleaner directly on the cabinet surface. Instead, spray cleaner onto a clean cloth. Do not apply a damp cloth to your cabinetry. Do not wipe cabinetry with a used dishcloth since it could contain traces of grease or detergents. The outside is what everyone sees, right? Wrong! The inside is just as important to keep clean because it is used daily! Who wants to see beautiful cabinetry only to find a disaster inside? Use items such as baskets and other storage containers to separate items and organize. Mark your calendar for a weekly quick cleanout of the pantry, cabinets, and refrigerator. Use some type of shelf liner to protect the insides from moisture and other damage. Don’t put away wet dishes. Make sure they are completely dry. While these cabinet cleaning tips sound simple, they are easy to over look and put off. By taking the time to keep the insides organized and the outsides mess free, your kitchen will be looking and functioning at its best! To learn more about cabinetry, go to www.wellborn.com. This entry was posted in Cleaning the Kitchen, Home Improvement, Kitchen Design, Kitchen Tips and tagged cabinetry, cleaning, home, how to, kitchen, Kitchen cabinet, kitchen cleaning, kitchen how to, kitchen tips, spring cleaning, wood on April 7, 2015 by editor. This guest blog is written by Damian Wolf, an experienced DIYer and blogger. It is commonly believed that if you wish to redecorate or refresh a room in your house or flat that you need to spend a lot of money. Yes, there are a lot of elements and items that cost a pretty penny, but did you know you can save quite a lot in other areas? In addition, a lot people are overlooking the fact that you can pull off a lot more with what you already have if you use your imagination. In order to avoid spending too much money, follow these tips on what to pay attention to; who knows, maybe you will think of something even more ideas along the way. In order to successfully use the space at your disposal, plan ahead. You don’t want to end up in a cramped kitchen, where you will collide with your family members. On the other hand, you probably do not need a huge kitchen in which you can play football. Find a middle ground, and be sure that there is enough space to function properly. If you lack space, think smart and use every inch. Built-in elements and cabinets that go into the ceiling are good for storage that takes advantage of every free area you have available. The kitchen is a place where you will be working, and therefore, your kitchen should have quality lighting. One source of light is often not enough, so installing more lighting is an excellent solution. Choose lights that are easy to mount at eye level and that have a low heat signature. Your kitchen will be a hot place anyway, so you will wish to reduce heating sources as much as possible. Also, choose lights that save energy, which means they will also save you money in the long run. Refrigerators, stoves, dishwashers and other kitchen appliances require sources of electricity. Be sure that there are enough power sources and that they are evenly spread out on a fuse system. Thus, if something happens, the whole kitchen won’t be left without power. And another tip: be sure to have a few plugs above your countertop, because you will be using blenders, mixers and other countertop appliances. Also, dishwashers require a water source, so don’t forget about this too. A lot of people neglect this important category, so be sure that you are not among them. Buying a few smoke and gas leakage detectors is not something that will empty your wallet, but it can save lives in return. In addition, mind the electricity system, and never spare money here. Fuses must be in order, so they can serve their purpose. If you are completely redecorating your kitchen, avoid using old elements. They have served their due, and maybe it is time to replace them. Follow local stores, if they have sales going on, or you can always hop to the Internet, and find something interesting there. However, if you wish to reuse your favourite cabinet, a simple paint job and lacquering will do the trick. Naturally, during the cooking process, the smells from frying food and the steam from boiling food cannot be avoided. But, they can be controlled. A quality air system will draw out all of the steam and smells, so you don’t need to bathe after each meal. Also, steam creates moisture on the walls of the kitchen, and this can weaken them; it may cause cracks, which can be much more expensive to resolve later on. Spills, splashes and drips are common in the kitchen, so you will need quality flooring. Parquet may be a beautiful choice, but is out of the question, because wood does not do well in humid surroundings. Think of ceramic tiles, for these are easy to maintain and are available in huge variety of colours, patterns and sizes. Ask the salesman if they have rough surfaced tiles; they will provide better traction and will be less slippery when wet. To stamp your kitchen as your own, you will need something of your own design. For example, nice curtains and ceiling fixtures in your favourite colors will bring out your personality. Play with colors and designs to open up the space even more and to draw out distinctive impressions. So, with everything said considered, you now need to think about what you wish to change in your kitchen, and just stick to the plan. You will see that rewards will be multiplied when you manage to combine something nice with something useful. Author: Damian Wolf is a writer and passionate DIY hobbyist. He mostly writes about home DIY projects, and all topics in home improvement. Damian is also a tools collector, who uses Gasweld online tools shop add power tool pieces to his collection. This entry was posted in Home Improvement, Kitchen Design, Kitchen Tips and tagged decorating, home design, home improvement, kitchen design, kitchen remodel, kitchen renovation, kitchen tips, renovation on January 14, 2015 by editor. Time and money are two things we often feel like we never have. It may not feel like it, but saving time and money is possible in the kitchen with a few simple tips. Also, visit our blog post 30 Minute Meals; these recipes should also save you time in the kitchen. How to save broth: Why not save leftover broth for those times when you need broth or stock to finish out a recipe? Whenever you’re working with broth or stock and have leftovers, just pour it into an ice cube tray. Freezing the broth makes it last longer. It also makes it easier to use. Next time you’re cooking, just throw some ice cubes into the pan. Make cookies faster: You’re already going to all of the effort to make cookies, right? Why not make an extra portion that you can freeze and use later. Just roll the dough into balls, throw them into a ziplock bag or container and you can make cookies at a moment’s notice in the future. We know, this idea clocks in at evil genius level (it’s so good!). How to make mayo: Ever wonder how mayonnaise is made? Well, there’s a quick and easy way to make mayonnaise for when you’re stuck in a pinch and need mayo to finish a recipe. This might happen to you when you’re baking a cake and there’s no mayo in sight. With a stick blender, mix one cup of oil and one egg until it looks like mayonnaise. How to serve ice cream: Once you serve ice cream like this, you’ll never go back to an ice cream scoop again. If you’re serving up the whole tub of ice cream, it’s recommended that you put the container of ice cream in hot water for twenty seconds. Next, even though it sounds weird, cut the ice cream using a knife. You should be able to cut nice slices of ice cream. How to cut grapes and cherry tomatoes: Forget cutting every single tiny tomato or grape one at a time. Put them in-between two lids and slice the nice through the middle to cut all of the tomatoes or grapes at once. 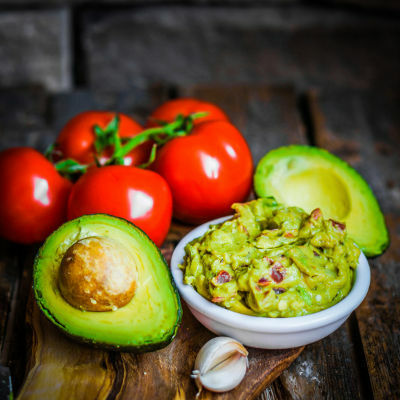 How to keep guac from going brown: Guacamole is delicious, but no one likes brown guacamole that stayed in the fridge for too long. You can squeeze some lemon on the guac to prevent this, but take it a step further by covering the top of the bowl of guac in water. The water will cover the guac so it doesn’t turn brown and it won’t mix into the remaining guac. Enjoy! How to open a jar: We’ve all experienced not being able to open a jar and going crazy. You don’t have to wait for someone else to open it. Use a bottle opener on the lid of the jar and then twist it open. Be sure to share your go-to money saving tips for the kitchen with us. This entry was posted in Cooking, Food, Kitchen Tips and tagged Broth, cookie, cooking, Guacamole, Ice cream, Ice cube, kitchen, Kitchen Save Money, kitchen tips, Mayonnaise on September 29, 2014 by editor. We all get stressed out when things aren’t going our way, and we’ve all been there when a recipe isn’t going as planned. Sometimes you were mistaken and you don’t actually have that one ingredient you needed. Here are some tips and tricks for reducing cooking stress and stress we get in the kitchen. Follow these tips for a more peaceful experience. Also, don’t forget to run the range hood while you’re cooking to avoid pesky smoke, smell and grease. -Read the entire recipe before you start cooking. It’s stressful to work on a recipe when you get halfway through and you figure out you don’t have everything you need to bring it to completion. Skimming the recipe ahead of time can help you avoid problems like these. -Set out all of the ingredients before you before getting started. This helps ensure you have all of the necessary ingredients before you get elbow deep in the recipe. It also helps to measure out everything ahead of time so you aren’t scrambling to sauté something while chopping something while stirring a pot of food while…well, you get the picture. -Use a smart phone or tablet app, like Tastebud, that will tell you what you can make with what’s already in the fridge. That means no more last minute runs to the grocery store to finish that recipe you’re working on and no more spending money when you have food at home that is going to go bad if you don’t use it. -Keep your kitchen clean and organized for stress-free cooking, Keep your knives sharpened and have a place for everything so you always know where it is. Also, clean as you go so there isn’t a stressful clean up at the end of the meal when everyone disappears and you’re left with a sink full of dirty dishes. -Delegate! Ask someone to chop up the salad, set the table, run the dishwasher, etc. Don’t leave it all up to one person, especially if he or she is doing all of the cooking. -Learn some slow cooker recipes so you can make a big batch of food for the next couple of days. You can prepare slow cooker recipe ingredients ahead of time and freeze them all together in a bag; when you’re ready to leave the house, just dump the bag into the slow cooker and dinner will be ready when you get home. -When you bring home food from the grocery store, prepare it so it’s easy to cook when you’re hungry. For example, divide meat and chicken and freeze it in easy to manage portions. With produce, go ahead and wash it; separate it so it’s ready to be thrown in the pot or into the salad bowl. -Lastly, eat foods that relieve stress. Avocados and bananas contain potassium, which lowers blood pressure; fish contains omega-3 fats, which calms the mind; carrots are fun to munch on without containing lots of calories; and chocolate releases serotonin and improves mood. Good luck cooking in the kitchen , and remember, don’t stress out! This entry was posted in Cleaning the Kitchen, Food, Range Hoods, Recipes and tagged Cook, kitchen, kitchen tips, life pro tips, range hood, recipe, Slow cooker, stress on August 6, 2014 by editor.